Whether we realize it or not, we all talk to ourselves every day. It’s usually not out loud, and it’s usually not something we’re even aware of doing, but we communicate to ourselves every time we look in the mirror. And, oftentimes, the things we say to ourselves aren’t very nice at all. And the list could go on and on! These are all things that we could never even consider saying to someone else, and yet we think them to ourselves all the time when we look in the mirror. The problem is that these thoughts affect us a lot more than we might think they do. What might seem like just a passing thought while glancing in the mirror can actually be devastating to our health and well-being. After reading Love Your Body: The Imperfect Girl’s Guide to Positive Body Image, I realized how far-reaching of an effect that body hate can have on our lives. “You are what you focus on and what holds your attention.What you spend time thinking about will dictate your decisions based on those thoughts. Eventually this begins to change the course of your life and your relationships with the people in your life” ~ Love Your Body, Pg. 6-7. While we might think that our negative self-talk isn’t a big deal and that it’s just something that everybody does, the reality is that body hate can affect every part of our lives, including the decisions we make and the relationships that we are a part of. When we have negative thoughts about the way that our bodies look, those thoughts are actually perceived as a form of stress by our bodies. Even though we usually think of stress as having too many things to do in too short of a time or maybe sitting in traffic and worrying about being late for an important meeting, psychological and emotional stressors can have just as much of an impact on our health as physical stressors can. And stress is bad news for our health. responds to every stress in the same way” ~ The Nourished Metabolism, Pg. 13. Being stressed has the potential to affect every part of our bodies in a negative way and it’s one of the biggest contributors to poor health. Being stressed also has a big effect on metabolism, and the metabolism plays a part in just about every aspect of the way our bodies function. Even if we think we’re doing everything we can to be healthy (eating nutritious real food, exercising, sleeping well, etc. 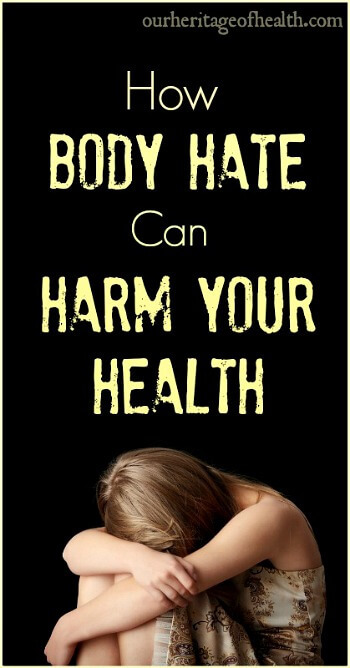 ), if we are constantly saying hateful things to ourselves about the way our bodies look, we are often doing ourselves more harm then we realize. So basically, body hate and negative self talk equals stress, which equals lowered metabolism, which equals decline in body functioning and health. Not good! 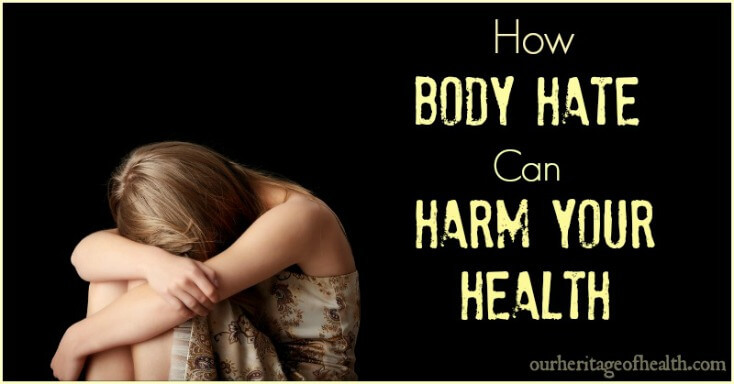 It might not happen that you will immediately develop some terrible disease as a result of hating the way your thighs look when you glance in the mirror, but over time, being in a continuous pattern of negative self-talk can really harm our physical, mental, and emotional well-being. It’s not easy to break out of a habit that we’ve been doing for years, but the first step to stopping the body hate pattern is to realize that it exists in the first place. Start paying attention to your thoughts when you’re getting ready in the morning or when you glance in the mirror. Would you say those things to a friend? And if you did, how would that make them feel about themselves? Our thoughts have an effect on us whether we realize it or not, but when we start paying more attention to them and noticing the kind of negative things we are actually saying about ourselves, we can start to work on changing our focus to the positive things rather than the negative, and we can begin to break free of the pattern of body hate that we’ve been trapped in for so long. Negative self-talk is something I still struggle with, as I’m sure most of us do, but now that I am aware of the effect that those thoughts can have, I am working toward the goal of accepting my body and myself, imperfections included. For more information about how to stop hating your body and start accepting yourself for the way you are, I recommend reading Love Your Body, and to learn more about the effects of stress on your health and how to heal your metabolism, I recommend The Nourished Metabolism. Both of these books have been very helpful to me, and they are two of my favorites.